The Warewulf cluster is ready to run HPC applications. Now, it’s time to build a development environment. In the first two Warewulf articles, I finished the configuration of Warewulf so that I could run applications and do some basic administration on the cluster. Although there are a plethora of MPI applications, many of them need to be built. Additionally, you might want to write your own. Both require a development environment of compilers, libraries, and MPI libraries and tools. In this article, I show how you can easily create a development environment for Warewulf clusters. HPC clusters are a very interesting topic in and of themselves. How do you easily create and deploy clusters? How do manage them? How do you monitor them? These are all interesting questions and, depending on your interests, really enjoyable topics, But at the heart of HPC clusters is the need to run or create applications, or both, parallel or serial. For running applications, you need compilers, libraries, and MPI (Message Passing Interface) libraries and tools. Although it seems like a simple concept – and for single systems it is – clusters require you to think differently. Clusters are disparate in terms of the OS, so you have to pay attention to how they are deployed and what tool sets are on each node. One could argue that the development and run-time environment has nothing to do with the deployment tools, and indeed, in the case of this article, one could argue that Warewulf has nothing to do with a development and run-time environment for clusters. However, I disagree. Keeping track of what packages and applications are installed on each node is of paramount importance, and this means the cluster toolkit becomes an integral part of the approach. For clusters, I see two approaches for a development or run-time environment: (1) a brute force approach or (2) a smart approach. In this article, I present the second approach for creating a development and run-time environment building on the Warewulf articles up to this point. The brute force way to deploy a development and run-time environment for parallel applications is fairly simple – just put everything on each node and call it a day. Although brute force seems fairly simple, in general, this approached might not be the best, going back to some of the fundamental arguments for stateless nodes. By putting the tools on each node, you have to pay very close attention to versioning, so the versions of all of the tools are the same on each node. If not, there is the potential for problems, and I have seen them before. A much more elegant approach, one that I call “smart,” is to put as many of the tools as possible on an NFS filesystem or some other common filesystem and then only put the minimum necessary on the nodes. This greatly reduces the problem of version skew between nodes. Plus, you can further reduce version skew to a minimum if you use a stateless cluster tool so that a node is simply rebooted to get the correct versions of tools. This makes Warewulf a wonderful tool for a development and run-time environment. In this article I’m going to illustrate with several examples how one might create and deploy a development and run-time environment. I’m going to use two MPI toolkits – MPICH2 and Open MPI – and a BLAS library, Atlas (Automatically Tuned Linear Algebra Software), as an example of a pure library that is used by applications. Initially, I will be using the default compilers that come with Scientific Linux 6.2 for compiling. Finally, just to complicate things a bit more, I’m going to install a second compiler that can be used for all of these toolkits and libraries. To tie it all together, I’m going to use Environment Modules to show how you can use multiple toolkits or any other packages in the development environment. The use of Environment Modules is extremely important and makes your life infinitely easier. Recall that there are four articles in this series about deploying Warewulf in HPC Clusters. The first two articles covered the initial setup of Warewulf and rounding out Warewulf to get the system ready for running HPC applications. The fourth article will add a number of the classic cluster tools, such as Torque and Ganglia, that make clusters easier to operate and administer. For this article as with the previous one, I will use the exact same system as in the first article, running Scientific Linux 6.2 (SL6.2). The purpose of this article is not to show you how to build various toolkits for the best performance or illustrate how to install packages on Linux. Rather, it is to use these toolkits as examples of how to build your HPC development and run-time environment with Warewulf. At the same time, I’m choosing to work with toolkits commonly used in HPC, so I’m not working with something obscure; rather, these toolkits have proven to be very useful in HPC (at least in my humble opinion). I’m also choosing to build the toolkits from source rather than install them from an RPM (where possible). This allows me to have control over where they are installed and how they are built. Today’s processors are becoming more and more complex and, in many ways, more non-uniform. For example, the latest AMD processors have two integer cores sharing a large floating-point (FP) unit. Alternatively, one of the integer cores can use the entire FP unit. Intel now has the PCI-Express controller in the processor, so if you have multiple sockets you have to pay attention to which core has a process utilizing a network interface to minimize traffic between the sockets. Consequently, you have to pay attention to where you place processes within the system. For both processors, process placement can have a big effect on performance. Two tools can help. The first is numactl (Non-Uniform Memory Access [NUMA] Controls). This tool allows you to start processes on certain physical hardware and control memory access for these processes. This is an extremely useful toolkit for today’s hardware, particularly in HPC, where we want to squeeze every last ounce from the hardware. The second toolset, hwloc (HardWare Locality), is a very useful toolkit because it gives you the tools and interfaces to abstract all of the non-uniformity of modern systems such as those that I previously mentioned. I’ve found it to be an invaluable tool for understanding the hardware layout from the perspective of the OS. Open MPI can use hwloc for proper placement of MPI processes. Depending on how you built the master node originally, numactl might already be installed because it comes with many basic installations. If not, it’s easy to install. One tool I really like in hwloc is called lstopo, which gives you a graphical view of your hardware layout as the hwloc abstraction sees it. For example, for my generic hardware on the master node, the graphical output looks like Figure 1. 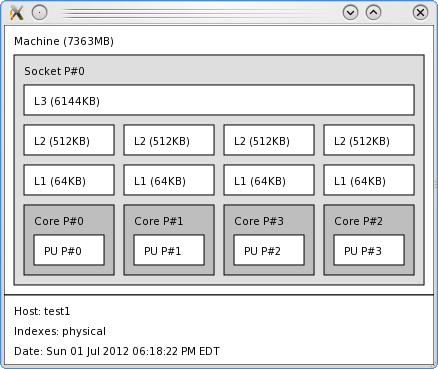 The graphical output shows you each socket (in this case, one), the cache structure (L3, L2, and L1), the cores (in this case, four), and the physical units (PUs) for each core (in this case, only 1 PU per core). It also shows you how the cores and the PUs are enumerated by the OS. That is, which core is number 0, which core is number 1, and so on. This can be very handy when you have complicated NUMA hardware. Now that the tools are installed on the master node, it’s generally a good idea to install them in the VNFS (virtual node filesystem) that I’ve been using, which requires a little more attention to detail. If you recall in the second article, I was able to install individual packages into my VNFS on the master node. First, I’ll install numactl to illustrate how this is done. The output (Listing 1) has had some details removed to shorten it, as noted with the phrase [cut]. Notice that it also installs Perl, making the total size of the packages about 11MB, even though numactl itself is only 54KB. In the grand scheme of things, 11MB is not very much space, but if this amount of space is valuable, you have two choices: (1) don’t install numactl, or (2) build it yourself on the master node and use NFS to share it with the compute nodes. The first option is up to you. My home system didn’t really need it because the physical layout is simple (see Figure 1), but for completeness sake, I think it’s important to install it. Again, it’s up to you. The second option is also up to you. I have not built numactl by hand, so I don’t know the options or dependencies in doing so. But just be sure to build it so it installs in an NFS-exported filesystem from the master node (e.g., /opt). I’m also going to install hwloc in the VNFS because it could prove very useful for tools such as Open MPI. To make my life easier, I’m going to follow the same installation procedure I used for numactl. The output (Listing 2) has also had some things removed to shorten it, as noted with the phrase [cut]. I think it’s always important to examine the output to understand the dependencies that come with the package. In this case, hwloc itself is 1.0MB, but the sum of it and all of the dependencies is 11MB. Again, this might or might not seem like a large amount to you. It’s your decision if you want to install it on the VNFS, install on an NFS filesystem from the master node, or not worry about it all. In my opinion, both numactl and hwloc are very important with today’s NUMA hardware. Therefore, I installed them in my VNFS. At this point, because I updated the VNFS, I should go back and rebuild it, but I’m going to wait because I want to get through the first round of development packages before I do that (no sense in doing it more times than needed). MPI (Message Passing Interface) is the lingua franca for parallel computing today. Although you have other options for writing parallel code, a vast majority of today’s parallel code is being written with MPI. Consequently, it makes sense to have at least one, if not two, MPI toolkits on a cluster. Several open source toolkits are available, but for the purposes of this article, I will stick to those that support Ethernet. In particular, I will focus on the ones that are commonly used: (1) MPICH2, and (2) Open MPI. In the following subsections, I’ll first build and install MPICH2 on the master node. Then, I’ll do the same for Open MPI. Finally, I’ll build and install a very common math library called BLAS using a tool called Atlas to generate the library. For building and installing toolkits, I follow a set of practices that I put in place a while ago. If you like, you can think of them as standard processes, or habits even, but the intent is to save time and create something of a paper trail, so I can follow what I originally did. I will try to point out my practices, but you are not obligated to follow them by any means. However, I do highly recommend you develop some sort of standard practices so you too can create a paper trail. The first practice I follow is where I put the toolkits when building them. By default I have the root user build and install the toolkits, and I do it in a subdirectory named src so that the full path looks like /root/src. I could have a user build the toolkits and then have root install them but I’ve found that it’s easier to just do everything as root. However, you need to be careful so you don’t inadvertently do something disastrous. The second practice is to install the toolkits in a standard location. You have several possibilities, but I put all of mine in /opt on the master node. This is where I put “optional” packages that aren’t necessarily specific to the toolkit. Plus /opt is NFS-exported to the compute nodes, so I only need to do this once. Although you could install them on every compute node, that’s costly for a stateless cluster such as the Warewulf cluster I’ve been developing in this series. Instead, it’s just as easy to install the toolkits in a directory on the master node that is NFS-exported to the compute nodes. I will discuss other practices I use when building and installing toolkits in the subsequent sections. Again, you don’t have to follow these practices, but it is important to develop some sort of standard practice. This will keep you from pulling out your hair and making a more supportable HPC cluster. This dumps the output from the help option to a file named configure.help. Then, I can use the normal Linux tools, such as more or vi, to look at the help options and select the ones I want to use. Notice that I install the toolkit into /opt/mpich2-1.5b1. I always install into a directory that reflects the version of the toolkit (making things easier for tracking the toolkit and version). This allows me to look back through the configuration output for anything that might be “weird.” Once I am satisfied, I then do the usual, make followed by make install. However, be sure to read the INSTALL file or README file that comes with each toolkit because some are different. If you see a “script” running, then you might have forgotten to end the previous one with ^d. The last command compresses everything as much as possible at the expensive of using more CPU time (I only need to do this once, so I’m not too worried about CPU usage). Build the toolkit as the root user in /root/src. Install the toolkit in /opt (in this case, I installed it in /opt/openmpi-1.6). Capture the output of ./configure --help into a file using the script command. Create a small script, conf.jeff, that contains the ./configure command and all of the options I want to use in building the toolkit. Run conf.jeff with the script command to capture the output from the configuration to the file conf.jeff.out (don’t forget to end the script with ^d). Run make with the script command and capture the output from make and make install to the file make.out (don’t forget to end the script with ^d). Once you are happy with the installation, run make clean and gzip -r -9 * in the root directory of the toolkit. In this case, the default options with Open MPI are fine. One other common library I like to install on HPC clusters is Atlas. This is a BLAS (Basic Linear Algebra Subroutines) library that is rather unique. It runs tests on your system during the build process so that it finds the best algorithms to produce the fastest possible BLAS libraries for your system. For the configure step (step 3) I sent the output to conf.jeff.out using the script command (I didn’t really capture the output from ./configure). Then for steps 4 through 7, I sent the output to file make.jeff.out so I could look at the output (there is a great deal). This whole build and installation process took a while, but it’s easy enough to follow. So far I’ve built two MPI libraries and a common and very useful library for HPC applications. You can continue and build more toolkits as needed, but you have to stop and think that at some point managing all of these toolkits from a user’s perspective is going to be difficult. For example, one user might build their application with MPICH2, and another might build it with Open MPI. How do you control which MPI is used when the application was built and how do you control which MPI is used when the applications runs. Fortunately, a very useful toolkit called Environment Modules allows users to control their environment, which means they can select which libraries, MPI, compiler, and so on are used for building an application and for running an application. Previously, I wrote a brief introduction for using and building Environment Modules (I will use the shorthand “Modules” in place of Environment Modules). Using Modules allows you to “load” a module that correctly sets the environment including paths to any binaries (e.g., compilers and libraries), dynamic library paths, paths for man pages, or just about anything you can think of that defines an environment. Then, you just “unload” the module, and the environment goes back to the way it was before loading the module. It’s a wonderful tool for systems in general, but for HPC systems in particular. I won’t explain too much about Environment Modules, you can easily read the article about it. Instead, I’m going to explain how I installed it so all of the compute nodes can use it and how I wrote the specific modules. I used the latest version of Environment Modules, version 3.2.9, and built and installed it following the same practices I used for MPICH2, Open MPI, and Atlas. The prerequisites for Modules can be a bit difficult, so be sure to read the INSTALL file that comes with the package. You might have to set some environment variables or define some paths for the ./configure command. For my master node, I had to install two packages, tcl and tcl-devel, so I could build Modules. Tcl was already installed, so I just did a yum install tcl-devel on the master node. It’s pretty simple but I did have to read the INSTALL document a few times before I got ./configure to run without errors. At this point, after make followed by make install, Modules is installed in /opt. Notice that I didn’t have to specify a directory for Modules because, by default, it adds a subdirectory named Modules. For my setup, the full path looks like /opt/Module. It also installs the version you are building as a subdirectory under that, so for my case, the full path is /opt/Modules/3.2.9. Then, every time they log in, Modules will be available for them. Notice that the last line is the addition that starts up Modules. Environment Modules itself is wonderful, but the power comes from writing the modules for various tools. For example, I already have MPICH2 and Open MPI on the system, but how do I easily switch between them? What happens when one application is built with MPICH2 and another is built with Open MPI, and I try to run both at the same time? To truly take advantage of Modules and these toolkits, you need to write modules for Modules. Rather than walk you through writing each module I’m just going to describe the process or “standard” I use in writing my own. (It’s based on the one that TACC uses.) You can develop your own standard for your situation. First, I add tools in categories such as mpi, compiler, lib, and so on. Then, under each category, I have another sub-group for each toolkit. For example, I might something like mpi/mpich2. Then under this sub-group I have the modules corresponding to each toolkit by using the version number. In the case of MPICH2, I might have mpi/mpich2/1.5b1, where 1.5b1 is the name of the module. This allows me to add other versions of the same toolkit while keeping the older toolkits available. The second thing I do is have standard fields in the module that explain what it is. These fields are the same regardless of the module. Listed below are the modules I’ve written. The listing was created using the module avail command. Notice that I’ve written four modules: one for the default compilers (compilers/gcc/4.4.6), one for MPICH2 (mpi/mpich2/1.5b1), one for the Atlas library (lib/atlas/3.8.4), and one for Open MPI (mpi/openmpi/1.6). These modules allow me to adjust my environment for a particular compiler (really, only one choice right now) and an MPI toolkit (MPICH2 or Open MPI) or add the Atlas library. As root, I had to create the subdirectories in the /opt/Modules/default/modulefiles directory (e.g., compilers, mpi, compilers/gcc). I’ve included the listings for GCC, MPICH2, Open MPI, and Atlas to show you how I wrote them. Everything seems pretty straightforward, and now you should have a pretty good working environment for building and running HPC applications, particularly those that use MPI. But what happens if you install a new compiler? This means you might need to build MPICH2 and Open MPI with the new compiler to make sure everything stays consistent, with no interaction problems. This also means you need to add more modules, possibly rewrite some modules, or both. I tested the compiler quickly and found that I had a missing dependency. I’m not sure why yum missed it, but after a little detective work, I installed libstdc++.i686 (evidently, the compiler is a 32-bit application). At this point, the compiler worked correctly and I could build and run applications successfully. However, you could have an easily overlooked, subtle problem. As part of the installation process, two binaries were installed only on the master node: glibc.i686 and libstdc++.i686. However, to run applications on compute nodes that were built with the compilers or to run the compilers themselves on the compute nodes, you need to install those libraries into the VNFS. In the following listings – I’ll spare the gory output from Yum – I show you how to install the packages into the VNFS. One last package needs to be installed in the VNFS if you want to be able to build applications using the Open64 compiler on the compute nodes. Although it’s optional, I sometimes have a need to build code on a compute node, so I will install the glibc-devel.x86_64 package, which isn’t very large and is easy to install into the VNFS. Now you have two compilers that users might want to use, and you need to rebuild both MPICH2 and Open MPI with the new compiler. (Note: I tried rebuilding Atlas with the Open64 compiler and could not find a way to do that, so I gave up in the interest of time). To make my life easier in rebuilding MPICH2 and Open MPI, I first created a module for the new compiler (compilers/open64/5.0). The module is simple and looks very much like the compilers/gcc/4.4.6 module. Notice that I used an extension on the directories indicating which compiler was used. The standard I use is that if the directory for a toolkit does not have a compiler associated with it, then the default compilers were used. Now that I have the new compilers installed and the MPI libraries rebuilt, it’s time to update the Environment Modules. Updating the Environment Modules really has two steps. The first step is to slightly modify the existing modules to reflect which compiler was used to built the toolkit. The second step is to write new modules for the toolkits built with the new compiler. In the first step, I renamed the current modules to new names. Table 1 lists the old module names and the corresponding new names. Notice that I just added the extension -gcc-4.4.6 to the modules to indicate the compiler that was used to build the toolkit. In creating these two new modules, I stayed with the same convention I used in the previous modules. You can see the two module listings for mpich2-1.5b1 and openmpi-1.6. One last comment about the updated modules: Be sure you load the correct modules so that the tool chain matches. That is, be sure the Open64 5.0 module is loaded, then the matching MPICH2 or Open MPI modules, and so on. There are ways to do module checks and dependencies in Modules but that is beyond the scope of this article. So far I’ve done a great deal of work setting up a development environment for users. The first step was to install two important toolkits, numactl and hwloc, on the master node and into the VNFS for the compute nodes. In the second step, I built two MPI libraries, a fast BLAS library, and Environment Modules (partly in the VNFS) using the default compilers. Next, I installed a second compiler and updated the MPI libraries and the modules. So, it looks like I’m ready to update the VNFS and boot a compute node for testing. WARNING:  Do you wish to overwrite ‘sl6.2’ in the Warewulf data store? Because I am just overwriting the existing VNFS, it is always useful to check the size of the VNFS itself (this affects how much data is pushed through the network). If the compute nodes are capable of running Fortran code, they are capable of running almost anything. Now I have a nice, very useful cluster with a good development and run-time environment. I have two MPI toolkits, a standard BLAS library, and two compilers, and the users can control their environments through Environment Modules. But stateless cluster tools that use ramdisks face one criticism: the use of memory for the OS image. I’ll compare both the VNFS size (affects network usage) and the size of the installed image from the second article (Listing 1) to what I have now (Listing 2). This output shows that I had a 55.3MB VNFS image that expanded to use about 217MB. At the end of this article, the VNFS and installed image was 71.3MB that expanded to 264MB. Adding all of the development environment only added 47MB (264 – 217)MB to the installed image. That’s not bad considering everything I got, and in today’s world, that’s not much memory at all. In this article, I wanted to spend some time illustrating some techniques for building and installing packages, particularly for clusters. Hopefully, I’ve shown you some things to think about as you go about creating your Warewulf cluster environment for running applications. In the next article in this series, I will discuss how to use some common management or monitoring tools for clusters that will make your cluster easier on the admin.